You answered this question for Tennessee, but I would like an answer for a Massachusetts semi-wetlands area: What can I plant to discourage poison ivy, or at least make it very clear that it is poison ivy? I definitely want native plants. Many thanks! Toxicodendron radicans (Eastern poison ivy) is a master of disguise. First it can be a groundcover-like vine crawling along under a shady tree, or it can be a shrub-like plant growing in a field in full sun (in northern regions), or it can be a huge climbing vine that has attached itself to a trunk of a mature tree. The young plants have many lookalikes to add to the confusion such as toothwort, Acer negundo (box elder), Rubus sp. (raspberry), Staphylea trifolia (bladdernut), and Rhus aromatica (fragrant sumac). Photos of some of the lookalikes can be found on the Ontario Trees & Shrubs website. Another place to look is the poison ivy website which has a mountain of information about this nuisance plant, including a skin rash hall of fame that is not for the faint of heart. Here’s a previous Mr. Smarty Plants question that was answered by Nan Hampton about controlling poison ivy and poison oak. There really aren’t any plants that will exclude poison ivy from an area. It is just that tenacious and the birds love to spread it around. To come up with a potential list of plants for your semi-wetland area, the first place to go is our Native Plant Database. Use the Combination Search feature instead of Recommended Species. This will provide a bigger selection with much more choice to narrow down. 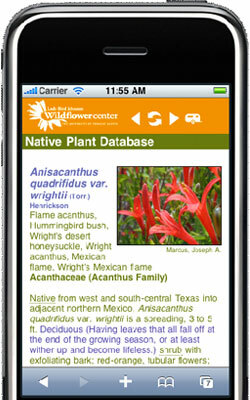 The volunteers and staff at the Wildflower Center who maintain the database have partners in different regions to help with these recommended species lists based on what is easy to access in local nurseries. Under Combination Search, select the following categories: State – Mass, Habit – shrub, Duration – perennial, Light Requirement – sun, Soil Moisture – moist & wet. You can narrow down this search further by indicating size, leaf retention, blooming time and bloom color too if you like. These search criteria will give you several trees and shrubs to consider then you will have to look at the ultimate width to see if they will fit in your space, how dense of a plant you need, and how tall they have to be to screen your view. Follow each plant link to our webpage for that plant to learn its growing conditions, bloom time, etc. At the bottom of each plant webpage, under Additional Resources, there is a link to the USDA webpage for that plant. Take a look there for more specific details about suitability before you put them on your final planting list. February 20, 2009 - What type of flowering plants, trees,and bushes will grow in Bastrop, Texas? I see lots of things around, please help, have never done before. February 24, 2015 - Could you identify companion plants that work well with the pink azalea (Rhododendron periclymenoides)?